USB 2.0 standard. Included:1 X Video Capture Card. 1 X USB wire. USB2.0 port. 1 X Driver CD. MPEG 1/2/4 video recording. If item is defective after 3 months, you can still send it back to us. We will send you a new one after receiving the defective item. 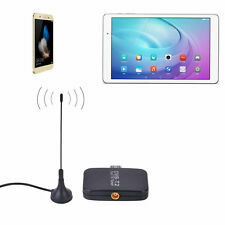 Search term:DVB-T2 Receptor, Micro-USB Tuner, Mobile TV Receiver Stick, For Android Tablet Pad, 48.25 ~ 863.25 MHz FrequencyFeatures:Requires Micro USB with USB OTG function.No internet connection required.Automatically search TV channels.Support record free to air DVB-T2 tv shows and store in android phone or pad.Low signal broadcast area have high sensitivity.Descriptions:Support change channels by touch screen.Make favorite channels for convenient watching.High sensitivity under low signal broad casting area.Specifications:Item Type: TV StickRemote Control:Not IncludedConnectors:USBInput Signal: 75 Ohm Digital TV Aerial InputReceive Frequency: 48.25 ~ 863.25 MHzFully Compliant with DVB-T2: EN302 755; DVB-T: EN300 7442K to 8K FFT SizePunctured Codes: 1/2, . 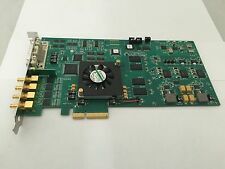 Video output: CVBS, VGA, HDMI. VGA: VGA output x 1. VGA Output for LCD/CRT Monitor. HDMI: HDMI OUTPUT x 1. TUNER: Antenna INPUT x 1. 1 x VGA DVB-T2 TV BOX. Composite Video Output for TV. Watch DVB-T TV on PC monitor, no software required. 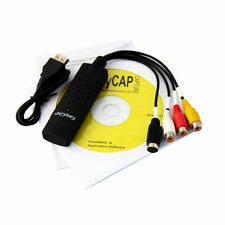 Sale Easycap USB 2.0 Video Audio VHS to DVD Converter Capture Card Adapter. Video tapes to DVD converter. Send Video to your PC through USB port. Super easy setup in minutes. Excellent Video Selector/Switcher: Smooth video source switching between PC, Composite Video input or S-Video input instantly. Supported TV standards: DVB-T2, DVB-T, DVB-C; VHF-/UHF band. 1 x USB 2.0 TV tuner for DVB-T2, DVB-T, DVB-C. Notes : Before buying, make sure the local DVB-T2/T signal, or else you can not use it.". Enjoy future-proof DVB-T2/T/C technology on your PC! Video tapes to DVD converter. Send Video to your PC through USB port. Excellent Video Selector/Switcher: Smooth video source switching between PC, Composite Video input or S-Video input instantly. 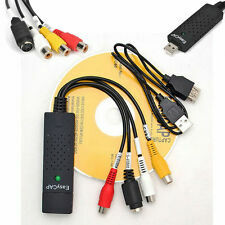 1 X USB VIDEO AUDIO CAPTURE ADAPTER VHS TO DVD HDD TV CARD. Sticks with this combination (RTL2832 R820T2) are relatively new on the market. The main difference to all the other supported tuners so far is that it uses a Low-IF (3.57 MHz) architecture instead of Zero-IF. Several breakout pads on the PCB for advanced users.This is an RTL-SDR software defined radio receiver with RTL2832U ADC chip, R820T2 tuner, 1PPM TCXO, SMA F connector and aluminium case with passive cooling. 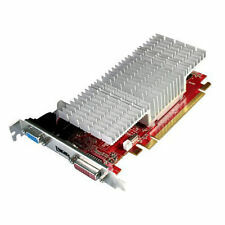 PCI-E Grabber is the best solution of capturing and recording High Defination video sources on your desktop PC. It supports Plug & Play, easy to install and use. 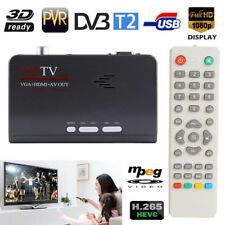 Video signal: 480i/p, 576i/p,720p,1080i,1080p 24hz/30hz (1080p 50/60hz not support). Supports Windows XP/Vista/7/8/10. USB 2.0 standard. 256MB RAM. Plug and play. 1 X USB wire. USB2.0 port. Mon. to Sat. MPEG 1/2/4 video recording. USB 2.0 Digital DVB-T2/T DVB-C FM+DAB+SDR TV Tuner Receiver Stick Dongle for PC. 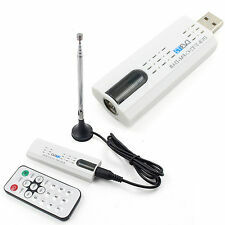 USB 2.0 TV Stick Tuner Receiver DVB-T DAB FM Antenn for PC Laptop Black. MHz, and indeed both ADS-B at 1090 MHz and L-Band DAB at 1463 MHz, as. complex samples. This has the benefit of having no DC offset spike in. ATSC HDTV USB Stick A681. MyGica A681 USB ATSC TV Stick is a Pen size digital USB TV Stick. You can watch and record ATSC live digital. A681 ATSC USB TV tuner. UHF/VHF Antenna for ATSC Terrestrial and AnalogTV. 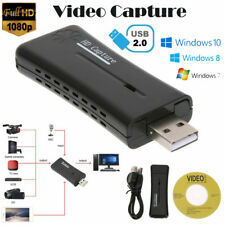 Features: USB2.0 HDMI Video Capture USB 2.0 fastest data transfer,simple to capture HDMI HD video into your computer. Support most capture and streaming software. 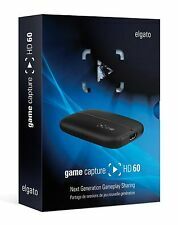 USB2.0 Game Capture just plug to your PC, you can use any 3rd party software to capture or stream your HD game,or other HD video source. Plug and play. MPEG4/MPEG2/MPEG1 video recording. Specifications: •HDMI input resolution:720x480(60p),720x576(50p),1280x720p(50).1280x720p(60p)1920x1080p(50p),1920x1080p(60p) • Complies With Universal Serial Bus Specification Rev. 2.0 • Video input:HDMI • Audio input :HDMI. 1 Micro USB DVB-T HD TV Tuner Stick Dongle. Android device need support USB OTG. Android 4.03-4.10. Android device with a dual-core CPU. Signal 75 Ohm Digital TV Antenna Input. R820T2 RTL2832U chip. Support SDR. Support Microsoft DAB drivers. tv system: full dvb-t and dab compliant. Full DVB-T bandwidth reception. 1 X DVB-T TV Tuner Receiver. recording format: dvbt tv-dvd(mpeg-2),fm radio/dab radio- wma. 1 X USB VIDEO AUDIO CAPTURE ADAPTER VHS TO DVD HDD TV CARD. With Professional and easy to use video editor software: Ulead Video Studio 10.0 SE DVD. Excellent Video Selector/Switcher: Smooth video source switching between PC, Composite Video input or S-Video input instantly. Ezcap272 Analog Video Recorder records video directly, no computer required. Model Number: ezcap272. Video Input: RCA CVBS analogue video. Video Output: CVBS analogue video by 3.5mm to 3RCA cable, HD. 1 x Tuner Receiver. Small and compact size, easy to carry. Watch TV in full-screen or scalable window. PC-interface: USB 2.0 (Hi-Speed). Supported TV standards: DVB-T2,DVB-T,DVB-C,VHF-/UHF band. TV recording formats. Tuner Supported: TV standards DVB-T2, DVB-T, DVB-C, VHF-/UHF band, Stereo / dual channel sound. 1x USB 2.0 TV Tuner for DVB-T2, DVB-T, DVB-C. Watch TV in full-screen or scalable window. TV Recording Formats: MPEG-2 transport stream, MPEG-4 H.264 (AVC). High quality video recording, support 4K and 1080P video capture and streaming. USB 3.0 high speed interface, powerful to get HD video into you computer up to 4K. 720 480 (60p), 720 576 (50p), 1280 720p (50p), 1280 720p(60p), 1920 1080 (50i), 1920 1080 (60i), 1920 1080 (24p), 1920 1080 (25p), 1920 1080 (30p), 1920 1080 (50p), 1920 1080 (60p), 4K. Geniatech DVB-T2 Stick T230C also supports SDTV reception (DVB-T), wherever you have either of them, you can use T230C as a DVBT hybrid TV tuner stick as well. DVB-T2 Freeview HDTV USB Stick T230C DVB-T2 Freeview HDTV USB Stick T230C. USB2.0 HDMI Video Capture. 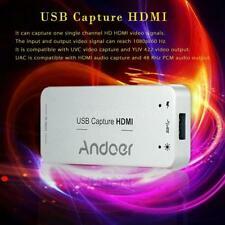 • USB2.0 HDMI Video Capture. USB 2.0 fastest data transfer, simple to capture HDMI HD video into your computer. •HDMI input resolution:720x480(60p),720x576(50p),1280x720p(50).1280x720p(60p). MHz, and indeed both ADS-B at 1090 MHz and L-Band DAB at 1463 MHz, as. complex samples. This has the benefit of having no DC offset spike in. up dramatically. Initializing the tuner takes way too long at the. Easy to use, simply download the free android app to your android device and 5. connect the ultra-compact TV tuner to the connector port. Open the app, pick a channel and start watching. 1 x DVB-T TV Tuner. With this USB2.0 DVB-T2 FM DAB TV Tuner Receiver, you can enjoy the original digital quality monitoring and recording on your PC. You can watch TV in full screen or window, shift pause and replay live TV when using. Yellow: For CVBS. USB2.0 video capture card Video /CVBS/Audio to USB2.0 capture card AV signal capture. USB: PC/laptop port is a popular USB 2.0 type. Video output device. White: for audio input. Audio input: stereo audio (RCA). Video tapes to DVD converter. Excellent Video Selector/Switcher: Smooth video source switching between PC, Composite Video input or S-Video input instantly. Send Video to your PC through USB port. Green LED for Power indicator. Signal: 75 Ohm Digital TV Antenna Input. 1 x DVB-T TV Tuner. UHF/VHF Antenna for DVB-T Terrestrial TV. 1 x Antenna. Interface: USB 2.0. Android device need support USB OTG. Android device with a dual-core CPU and NEON s.
Easycap USB 2.0 acquisizione Audio Video VHS To DVD Converter Grabber scheda. Questa acquisizione video, Video possa essere inviati al PC tramite porta USB. 1 Adattatore scheda di acquisizione Video USB. Support Microsoft DAB drivers. DAB radio: L-Band-1452960~1490624 KHZ. TV system: Full DVB-T and DAB compliant. Full DVB-T bandwidth reception. 1 x USB DVB-T TV Tuner Recorder. Receiving frequency: FM radio: 87.5~108 MHZ. DAB radio: L-Band-1452960-1490624 KHZ. TV system: Full DVB-T and DAB compliant. Support Microsoft DAB drivers. 1 X USB DVB-T TV Tuner Recorder. Full DVB-T bandwidth reception. Receiving frequency: FM radio: 87.5~108 MHZ. It have 3 input modes: HD, component, composite. Audio Output: HD(Pass-through from HD or L/R) (Digital); 3.5mm Stereo (Pass-through from HD or Audio RCA L/R Input) (Analog). Audio Input: HD (Digital); RCA Audio L/R, 3.5mm Microphone In (Analog) (Note: Microphone without pass through for HD input). USB 3.0 to VGA adapter based on the Fresco Logic FL2000 which is compatible with osmo-fl2k osmo-fl2k allows these adapters to be used as general purpose DACs and SDR transmitters, which can currently be used to transmit FM, DAB, DVB-T, GSM, UMTS and GPS signals, with more to come soon. [View the full talk on Youtube] (https://www.youtube.com/watch?v=VRvLVjLQSaw) Combine with our [USB RTL SDR RTL2832U R820T item] (https://www.ebay.com.au/itm/302529117549) to create a HackRF capable system at a fraction of the price! Specifications ---Colour: Random ---Port support: USB 2.0 / 3.0 port ---Video interface: VGA ---Resolution: 1920 * 1080 ---Color: Blue, black (Sent randomly) ---Length: 24. Pinnacle System GMBH 710 USB Rev 1.0 Movie Box Movie Capture Hub Device.Works.